If you’re shopping around for a new leaf blower, you’ve likely run across a lot of different options. Buying the correct leaf blower for what you need is important because you don’t want to waste your money on something that you don’t really need. One of the first things that you should consider is whether you need a gas or electric blower. There are many differences between the two, so understanding the pros and cons of each will give you a good starting point and narrow down your selections considerably. Skip to a quick overview. If you have a larger yard or driveway, then you may want to consider a gas leaf blower for a couple of reasons. For starters, they are more powerful than electric. They are also more mobile since you won’t have to worry about stepping on an extension cord that frequently comes with electric blowers. Whether you are blowing leaves from one side of your yard to the other or blowing snow off of your driveway in the winter, a gas blower could be your ticket to easier work. However, gas blowers do have some downfalls. One of the main reasons why people may not like gas blowers is because they are a lot noisier than electric ones. Since they require gas, they will also be a little messier and require a little more maintenance. Then there’s also the issue about air pollution. You will pay a little bit more for a gas leaf blower, but it is well worth it if you have a medium-to-large size area that you need to use it for. The maintenance with filling it up with gas and oil can be slightly time consuming. However, you will make up that lost time when you actually get to work! Gas leaf blowers are available in handheld and backpack versions. Unless you have a small landscaping or construction business, or just a really big yard, then the backpack blower is probably not necessary. You can find gas-powered blowers as cheap as around $70 or as expensive as around $500. The cost difference depends on the brand and other features, such as power and wind speed. Here are a couple of examples of gas-powered blowers that you can consider: Hitachi (handheld) or a Husqvarna (backpack). One benefit of electric blowers is that they are a lot lighter than the gas-powered blowers. You can find electric blowers in either corded or cordless versions and all of them are handheld. Obviously, if you have a corded electric blower, then you will be limited in your mobility. A cordless electric blower is convenient because you can start it up with very little effort and can get on with your job. The main downfalls of electric leaf blowers are the limited mobility and the lack of power. Because of that, you would be better suited with an electric blower if you have a small yard or driveway that doesn’t require you to cover a lot of ground. You can get electric blowers with different power and speeds, but they still won’t be as powerful as a gas leaf blower. You will probably get a better long-term value with a corded electric blower because it simply connects to a power outlet. Cordless blowers have rechargeable batteries. While those may be more convenient, you will eventually have to replace the battery or get a new blower completely. It would still probably end up being cheaper than a gas blower when you factor in the amount that you will spend on gas and maintenance, however. Electric blowers are a little more cost-effective than gas-powered blowers. You can find some electric blowers as cheap as around $40, but they can also go up to around $200 for the higher quality options. Here are a couple of different options of electric leaf blowers that you can consider: Black&Decker (cordless) or Toro 51585 (corded). So with this information, the first thing that you need to do is assess the size of the area that you will be using your leaf blower for. Most people who just want a leaf blower to push some leaves off of their driveway or yard will do just fine with an electric blower. However, people with larger yards may prefer gas-powered leaf blowers. The gas-powered blowers are nice because you don’t have to worry about recharging a battery. And if you have a large enough project where you run out of gas, then it isn’t too much of a chore to fill it up and continue working. Even if you have a smaller yard, a gas-powered leaf blower is still an option. Some people don’t want to have to deal with a tangled extension cord or run the risk of having the battery of an electric blower die on them. If that’s the case, then a gas-powered leaf blower is a good choice. If you deal with back pains or other physical issues, but still need a blower, then the electric leaf blower is probably the best option. The electric blowers are lighter and easier to work with, so they won’t cause as much discomfort for you. Either way you decide to go, a leaf blower will make your life much easier when compared to a rake or broom. 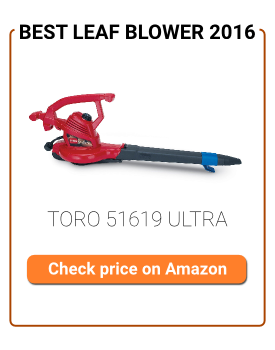 Shopping for a leaf blower can be exhausting because of all of the options that are available. Simply narrowing down your options by choosing whether you need a gas-powered or an electric leaf blower will save you a lot of time and ensure that you are making the most cost-effective decision for your needs.